Saturday (9/20) morning, we took our boys, Cooper (4) and Caden (3), to a nearby park. I had planned on reading the newspaper while the boys played, but decided to join them on the playground. I took Caden down a big three-story slide, which he was apprehensive about, but I convinced him to go. The ride down was a little rough and both of Caden’s Crocs were torn off on the way down. Unfazed, he climbed right back up to the top and begged me to take him again. Going against my intuition, I conceded to a second trip. Despite my best efforts to keep him safe, on the way down as we went around one of the turns, his left leg got jammed somehow and I heard a pop/snap sound. Caden immediately started crying and as we exited the slide I told Shannon that we needed to go to the hospital. We raced to the emergency room with Shannon sitting next to Caden trying to console him during the (what seemed like forever) drive. After a long wait in the ER and two rounds of x-rays, we got the bad news - he had a buckle fracture on his left tibia, right below his knee. Because the break/fracture is on a weight bearing bone, the doctor said that he'll need to stay off of his feet until it heals! They put him in a full-leg splint and he should be getting a cast in the next week or so. So, one day after turning 3 and getting a new big-wheel and two weeks into preschool, Caden won’t be allowed to walk, run or ride for the next 4-6 weeks!!! He seems to be in pretty good spirits and is starting to figure out ways to get around. Yesterday, I jury-rigged a pedal car which allows him to put his broken leg up and pedal with his right. He was so happy to be able to get out and play. Everything worked out and he will be fine, but from the time it happened until we got the diagnosis, I was a wreck. Now that we've gotten our first trip to the emergency room out of the way, I'm hoping we won't be doing that again any time soon. So sad to know about your son's buckle fracture. 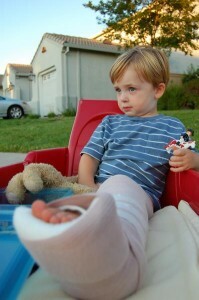 My 2 year old son also got buckle fracture at right proximal tibia and had a cast for 4 weeks since october 10th. Now, the cast has been removed, but he still not putting weight on his right leg? Do you think its normal? How long did it take your son to start walking? One more thing, did the doctor told you that fractures at proximal tibia might in future develop valgus deformity of knee? I appreciate your letting me know. 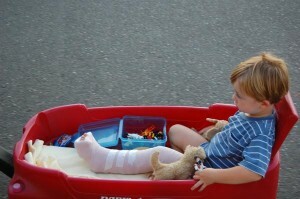 @Nadia - Sorry to hear about your son's fracture! Caden's was a bit lower on his tubia, so no, our doctor never mentioned anything about valgus deformity of knee. Caden was able to "walk" with his splint after a couple of weeks, so he has been walking since it was taken off. Initially he had a limp but even now, after a month, sometimes it is still noticeable. Best wishes to you and your son!